20, Jalan Persiaran Maju Cemerlang, Taman Perindustrian Maju Cemerlang, 81800 Ulu Tiram, Johor, Malaysia. 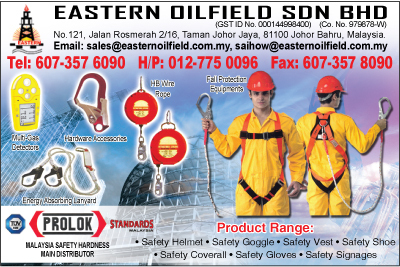 My profession is that of a Business development for Eastern Oilfield Sdn Bhd. 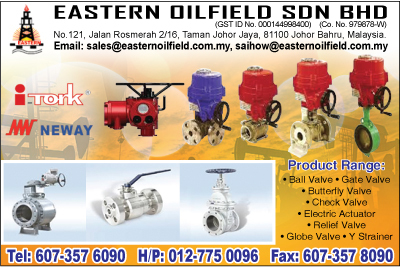 This is a company that is well established in Johor Bahru, Johor / Malaysia. We are specialized in supplying steel structural, pipes & fittings, gasket, bolt & nuts, ringing hardware, safety products and generator sets. We do fabrication, machining and forging of all kind of material to meet client & engineering requirement as per their requested specification. As our vision ,we do provides reliable delivery and services to all sector similarity to chemical & petrochemicals industrial , power plant, water treatment plant, oil & gas industries, onshore & offshore engineering fabricators and contractors. I’m here contacting you regarding if you need any supply, I can assist you to all sources. Bolt & Nuts: ASTM A193 B7,B7M,B8.B8M,B16,B8T,L7 & L7M , S304/L , S316/L , S 310 , S 317/L , S 321 , DUPLEX & etc . Piping accessories: Pipe clamps, U-Bolt c/w Neoprene Insert, Anchor Bolt, Tie Rod, Eye Bolt etc -Special fabricate follow drawing. Coating services: Hot dip galvanized, Zinc Plated, Cadmium, Zinc Nickel, Xylem PTFE Fluorocarbon coated Blue/Red/Green/Yellow/White. Others: Gasket, Valve, Teflon, Neoprene, Steel Wire Rope, Shackle Sling, Generator sets etc. 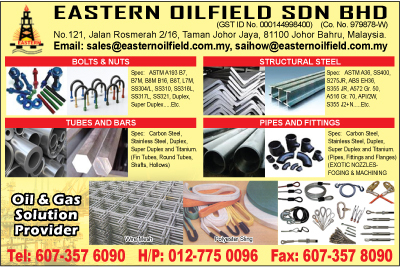 As for “ Eastern Oil Field Sdn Bhd in which withholding eight types of sales agency and dealer right such as follows to supplies the market and industries needs.